The Chinese smartphone manufacturer, Xiaomi is busy in launching its flagship mobiles of late, Its latest phablet Redmi Note 3 flash sale has reached India on Thursday. Xiaomi is continuing its Redmi Note 3 flash sale in its website Mi.in and Amazon.in on March 9 at 2PM. UPDATE:: Now we are providing an option to cho0se the variant you want on Redmi Note 3 flash sale, so you can get your favorite colors and type. How does this sale concept work? Registration: User has to register for sale on Amazon.in. On sale: check your internet connection and be ready. First come first serve is policy. As soon as sale time begin a buy now button will appear in place of the countdown. Click as fast as possible. How does Flipshope help in Redmi note 3 Flash sale? 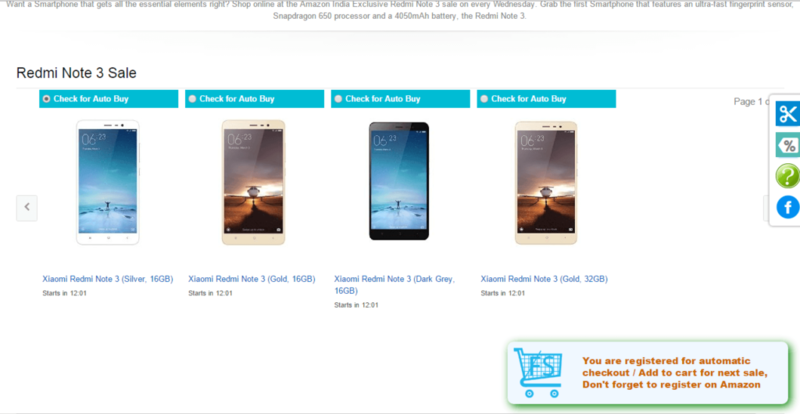 Steps to succeed Redmi Note 3 Flash Sale. Following the steps below, you can now buy Redmi Note 3 mobile without getting on your nerves. Step 1: Download the Flipshope add-on from the website Flipshope homepage. Add the add-on to Chrome using the Add To Chrome button. The add-on then appears on the top right of your browser. Step 3: Your registration for the Xiaomi phablet is confirmed if you spot a buish green popup at the bottom right of your browser. Step 4: Exactly one hour before the sale, the popup changes to yellow. Ensure that you have not placed any orders and your cart is empty. Just 5 minutes before the sale, the popup turns green. Step 5: Choose the variant you want to buy. Reload the page if you do not see the option to choose. Step 6: Flipshope will automatically click the “Add to cart” button in every one tenth of a second. When the sale begins, the mobile will be added to cart and you will be redirected to the next steps. Step 7: If you choose the auto checkout option then Flipshope extension will automatically fill the delivery details you have already specified in the form. Thus you have ordered for your mobile without any hassles. Step 8: Still you would have time before the sale goes off. You can cancel your order if needed. Disclaimer:: We just automate the clicking process but we do not guarantee the success because there are several other factors which may effect, like your net connection or Amazon’s reply to your request. But what we can guarantee is that if you could not get it using auto buy then there is no way that you can get it by manual click because extension’s click response rate (i.e. 10 clicks per second) is much faster than yours.